Issue #51 of the Green Lantern Crops concluded with Alpha-Lantern Boodikka sacrificing herself so her fellow corpsman could recharge their rings. Boodikka is able to regain her humanity; and together with comrades Kyle Rayner, Soranik Natu, John Stewart, and Lantern Hannu they are able to rally the people of planet Grenda against Cyborg-Superman. Former Guardian of the Universe, Ganthet tries to repair and de-mechanize Alpha Lanterns at the malicious request of Hank Henshaw aka Cyborg-Superman. Henshaw is still trying to find a way to regain his humanity. Yet he doesn’t care much for Ganthet’s pleas of not knowing whether or not he can actually repair the Alpha Lanterns, let alone do the same thing for Henshaw. There are a few really cool scenes in issue #52. Notably, panels 2 and 3 in which Lantern Boodikka reflects on each aforementioned corpsman, as they stand before her. As her humanity returns she remembers how she feels towards Kyle Rayner and the other Lanterns—one particular instance has her battling Cyborg-Superman for the control of her own mechanical body. We witness that while most of Boodikka’s body is artificial, her willpower and her honor, as a Green Lantern, remain strong. The end of issue #52 focuses on equality and acceptance within the Green Lantern ranks. 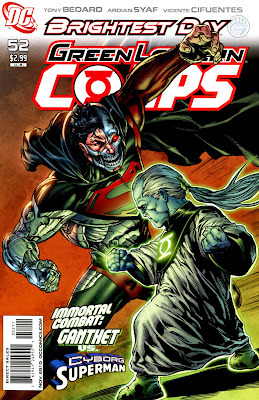 John Stewart says, well trying to repair Boodikka, “Do you really thing I’d abandon a fellow Lantern?” That’s what issue #52 and the prior issues leading up to this conclusion were trying to proclaim; that even though the Alpha-Lantern’s are mechanical, they’re still worth treating with respect and dignity. The humanity of the Alpha-Lanterns is still intact; it’s just buried deep in their cybernetic bodies. 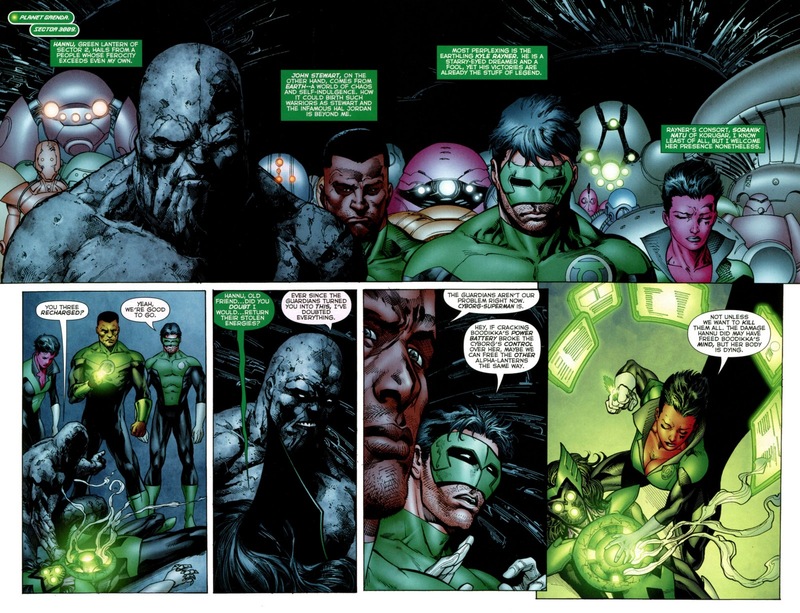 Upon returning to Oa, each respective Alpha Lantern is repaired in order to let their humanity flourish. The Guardians then bestow Honor Guard status (which allows a Lantern to patrol the entire Universe, not just a designated sector) to a handful of Green Lanterns, including Kyle Rayner and John Stewart. Now that Kyle Rayner and John Stewart are among the Honor Guard of the Green Lantern Corps things are sure to be very interesting in the coming issues.